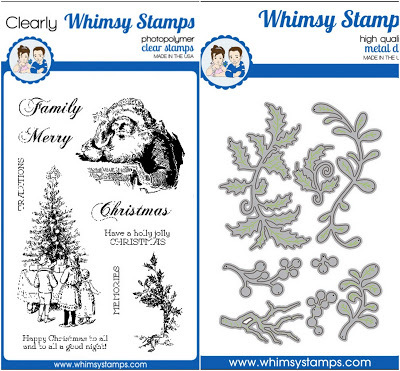 Welcome back to day three of the Whimsy Stamps September release! All new products will be available to purchase on Tuesday, September 7. I took a piece of acetate and rubbed some crushed olive distress ink on it, spritzed with water, then laid a piece of watercolor paper on it to pick up the ink. Once it was dry, I stamped the tree on it using peeled paint distress ink. The sentiment is stamped in black, and I added some strips of cardstock along the bottom and a gold mini poinsettia. Working backwards, I layered up the card by putting the olive panel on a kraft base first, then the main panel on top last. Love the cool colors on your Abstract Christmas tree and the Oh What Fun trees...super cute. and what an interesting Old Fashioned Christmas card technique!